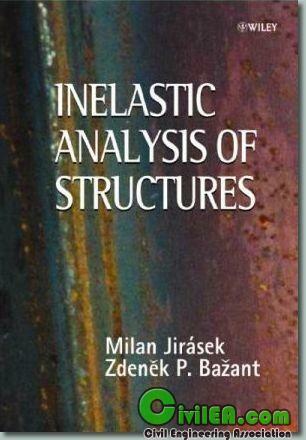 Inelastic Analysis of Structures - Jirasek, M.; Bažant, Z. P.
The modeling of mechanical properties of materials and structures is a complex and wide-ranging subject. In some applications, it is sufficient to assume that the material remains elastic, i.e. that the deformation process is fully reversible and the stress is a unique function of strain. However, such a simplified assumption is appropriate only within a limited range, and in general must be replaced by a more realistic approach that takes into account the inelastic processes such as plastic yielding or cracking. * creep and shrinkage effects in concrete structures. * localization of plastic strain. Inelastic Analysis of Structures is a textbook for basic and advanced courses on plasticity, with a slight emphasis on structural engineering applications, but with a wealth of material for geotechnical, mechanical, aerospace, naval, petroleum and nuclear engineers. The text is constructed in a very didactical way, while the mathematics has been kept rigorous.